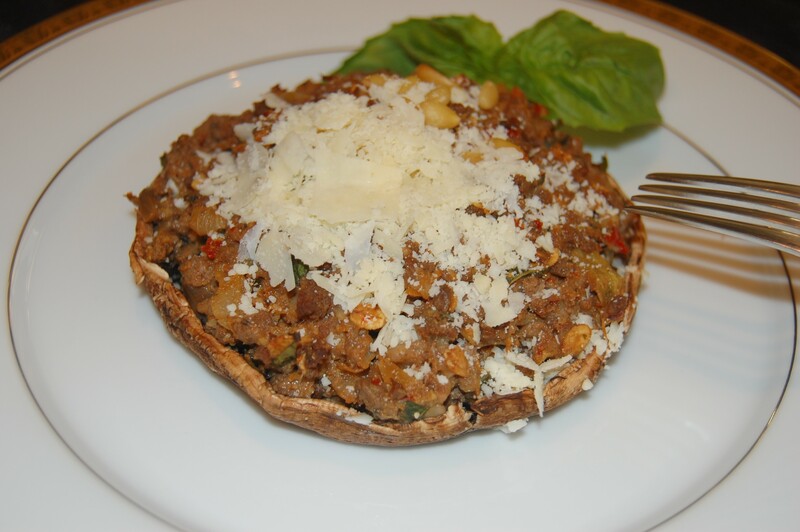 This Stuffed Portobello Mushroom dish has an elegant presentation, tastes delicious, and is portion controlled. What more could you want in a healthy meal? Enjoy with a side salad on the LCD and MD Key Diets. Wash portobella mushrooms; pat dry with a paper towel. Cut off stems and hollow out with a spoon. Dry upside down on a paper towel. In a separate bowl, mix rolled hot cereal with 2 T. non-fat milk to soften. Set aside. In a large skillet over medium heat, add 1/2 T. olive oil and onion. Saute for 2-3 minutes. Add ground beef, garlic, salt and pepper; cook until just brown on the outside and pink inside, about 4 minutes. Turn off heat under skillet and let the meat rest in pan. Add the olives, red peppers, basil, 1/2 T. olive oil and Italian seasoning to the rolled hot cereal. Mix into the beef. Add the whipped egg and 1/4 cup of the parmesan cheese to the beef. Mix thoroughly. On an oven-safe baking tray, spray it with some olive oil flavored non-stick spray and place each portobella mushroom on the tray. Spoon the beef mixture evenly into all four mushroom caps. Bake in a 400 degree oven for approximately 15-20 minutes. Remove mushrooms from oven and top each with a sprinkle of parmesan cheese. Serve with a side green salad. Approximately 330 calories, 34 grams of protein, 15 grams of carbohydrates and 15 grams of fat.